Pressley appointed new Fleetwood manager. 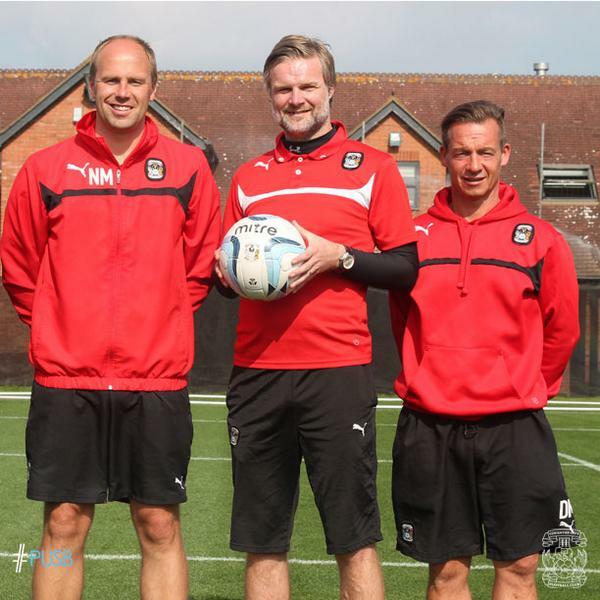 [IMAGE: Coventry City Football Club] Assistant manager Neil MacFarlane, manager Steven Pressley & development coach Darren Murray. Former Coventry City manager Steven Pressley has been unveiled as the new manager of League One side Fleetwood Town. Pressley, 41, was sacked as manager of the Sky Blues is February after 100 games in charge, and has been scouting for Premier League side Southampton since. Just months before his sacking, Pressley had signed a new four year contract to stay on as manager of Coventry City after being linked with the then vacant Huddersfield Town job, where he would have replaced Mark Robins, the man he also replaced at The Ricoh Arena. Now the former Scotland international takes charge at Highbury, with his first game coming on Saturday when City themselves are the visitors. Pressley replaces Graham Alexander with The Cod Army currently sat 23rd in League One with Neil MacFarlane also rejoining Pressley’s coaching staff as assistant manager. « Armstrong in Final Three of PFA Player of The Month vote.